Are the coins in the final game going to be cheap plastic pirate doubloons? Will the final miniatures be 3D printed? Will there be resource cubes in the final game instead of custom tokens? Will the box be as small as it is here? Is this the size of the final board? The answer to all of these questions is (let’s say it together): “No, it’s just a prototype.” The final game will be bigger and better and custom and pretty. Now, these are perfectly reasonable questions. Sure, there’s a bit of judgment to them, but they stem from genuine interest and curiosity. That’s fine. But I realized that what was super obvious to me–that it was a prototype, which is not at all indicative of the final look or quality of the game–was not super obvious to other people. Even people in the game industry. I’ve concluded that this is because the Scythe prototype was really nice–so nice that people mistook it for a final game (even though it hadn’t even launched on Kickstarter yet). If it had looked a lot more like a prototype–less art in particular–people may not have been confused. Though, honestly, I’ve had people ask those types of questions at every stage of the prototype process. So I’ve determined the following: From now on, when I’m ready to feature a prototype in public, I will do everything in my power and budget to make it look exactly like the final game. It will cost more to do this, but I believe it’s worth the expense to save people the confusion and judgment. There’s just something in us that sees a prototype and can’t help but wonder if it’s really the decision the creator made for the final version. Are they really using a generic plastic dinosaur instead of a custom miniature? Are they really using M&Ms as tokens instead of wooden cylinders? Have other designers run into this? I’m curious to hear your thoughts in the comments. No, fortunately. We had to cut costs somewhere, and decided to send a Black & White zero-art prototype to reviewers, this saved us several hundred dollars. When we played it, and sent it to backers and had blind playtests, nobody asks “Is this the final art?” haha. (Note: we only sent it to the reviewers we have the best relationships with, and that we knew would understand and present it well regardless. It was a great success. …*phew*). John: Yeah, I would kind of put that in a different category as a publicly displayed prototype. When you send a prototype to a reviewer, you have the chance to tell them specifically what’s final and what’s not. But when it’s in public, you can’t explain that to every person who walks by and see it. I think there is some merit to having a very bare-bones prototype in that situation too, though I’m not sure it would catch my eye as a consumer. From what I’ve heard other publishers say, they try to make the prototype as close to a finished product as possible. I doubt there’s anyway to avoid the questioning all together though. Is it particularly annoying to you or do you feel spending the additional money would better represent Stonemaier? Yeah, I think it’s about representing the brand. And the game. In a convention setting, it will probably be most peoples’ first and only exposure to the game, so I want to leave them with the most accurate impression possible. We’ve been asked this question a fair amount with our campaigns. In fact, with the current campaign we’re running, we’ve been asked if they’re able to pick the game up at PAX Australia (which is on next week) even though our campaign would still be running several weeks after PAX! That would be quite a fast turnaround. :) I had some people asking if we’d be selling Scythe at Essen even though the Kickstarter didn’t start until a few days later! From my perspective, going for most games I know that it is a prototype, This was vary obvious when I got a chance to do a game of The Others at Gencon. Although I didn’t think to ask about board size. I guess in the end we want to know what the final version will look like, and it may depend on the consumer and how familiar they with the project. It’s the game play that matters most though. If you look at the Tiny Epic series, they are good games, In a tiny little package. That being said, and I saw the answer about the box size on twitter, What is the Final size of the gameboard when its folded up? Was just wondering Length by Width. I’ve seen your Epic stack of components, and I know the box is 296 x 365 x 86mm, the board is 818×624. I want to guess the board folds over into 8 sections. Having worked with fitting game pieces into newer boxes makes me curious. Sean: Right, the Scythe game board folds into 6 sections. It’s enough room for it to fit into the box with a little more than the width of a finger on two of the sides so you can lift it out of the box. Actually that would probably end up being the best promotion for the game, ultimately. Because someone sees it and think, “Holy cow, this is AWESOME” and they know this will be what the game is actually like. Oliver: I agree that it is good promotion for the game, as people can get excited over what the final game will really look like. 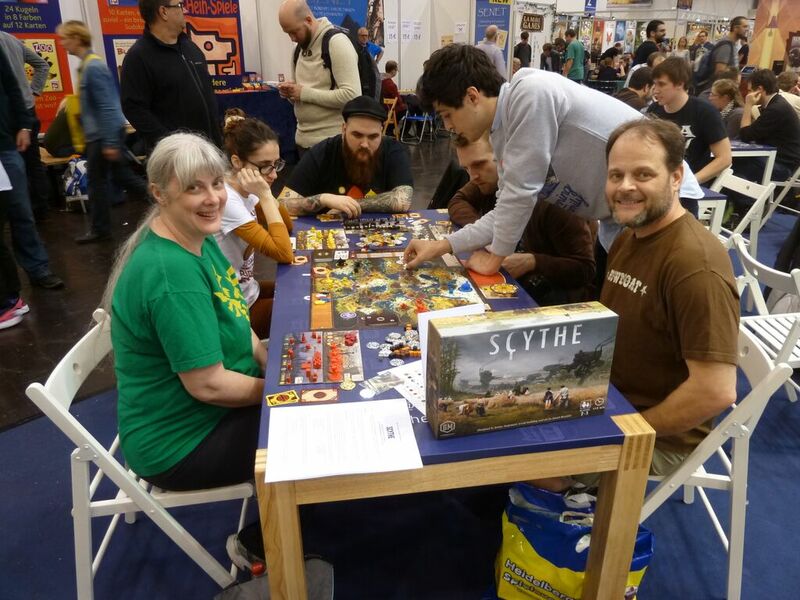 I was also pleasantly surprised to the Scythe playable at the Spiel in Essen. But when I saw it, I also immediately thought: Did I miss the Kickstarter? And (also with a negative connotation I must say): Is this what the game looks like? There was nothing on the game tables that showed that this is not the final product. It was shown on the show floor like all the other games that where on sale there. I think it would be enough to mark the game as “not final”. I don’t think I need a game to be “as close to final” to play it. But on a show floor, where people walk by the gaming tables, often not having the time to play it, it should be made immediately clear that this is only a prototype (and of course a call to action to learn more about the final version). Hamsta: Yeah, I think that’s part of the problem. There should have been a sign saying it was a prototype. For our plushies we were 98% there, so we were able to answer yes to those types of questions for that. But our app only had one story, the prototype story, and we had to field lots of questions about the content being so small. We had to explain that we’d use the majority of our kickstarter dollars to pay for the software and for content production. People got it, but I’ve learned that often people can’t see your grand vision within at least some explanation by you, regardless of how close you are. Chris: That makes sense, and I agree that it helps to be there in person to explain it. I wasn’t at Essen, unfortunately. I believe an elegant but simple sign indicating the game is a prototype would suffice for casual observers in a fair like Spiel. Additionally I would include a one page (maximum) list of the prototype characteristics compared to the intended final product. All this introduced by a brief paragraph explaining the need for a prototype during the game development process. Charly: That’s a good idea! If you want a good example, check out fantasy flight pre release games. They have “Beta” printed on their prototypes. 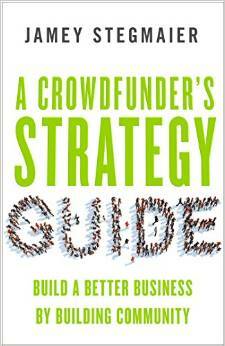 Hey Jamey, I just read your book over the last 3 days. I finally picked it up hearing so much about it. I liked it a lot and am going to start reading your blog here. Thank you! Btw the prototype looks amazing. I thought it was the final design too. My inclination would be to go the other way – make the box *less* final. The one thing the Scythe demo tables have that I’ve never seen on any prototype before is the full-wrap box. There seems to be the universal ‘not final’ box – solid color cardboard with tentative cover art glued to the top and usually with a 3/4″ or so gap around it. That just instantly establishes that the this is not a production ready copy. That’s when we in the IT industry roll our eyes, sigh deeply, and mutter “Users… ” under our breath. It’s sort of like an analogue of the ‘uncanny valley’ in CG representations of real humans. As you get closer to the final product, folk will start noticing all the imperfections, wondering if they’ll remain. For me, this is a (new) reason to stick with paper on top of sleeved cards rather than POD. It clearly screams ‘this is a prototype’ when folk play such a thing and I think that the art can still entice folk even with such cheap assembly. I saw this behavior firsthand a couple of weeks ago. I’d taken my pnp of Scythe to a game gathering, and someone there who’d just returned from Essen insisted it had been for sale at the show. My gentle attempt to dissuade him of this fell on deaf ears. No, it had been there, and the only reason he didn’t have a copy was because the line was so long. Sigh. We’re aiming to take our prototype to a local Protospiel Event in April so that we can continue playtesting our game. But – at what point in the game development/playtesting process do you think game designers should do this? And how pretty should the Prototype be? Linda: Thanks for your question. I think designers have different approaches to Protospiels, but if I were to attend one, I would wait until the game is functional and fun but not finished. I would also make sure that it looks good, as this is your chance to make a great first impression. I’ve always been curious as to the cost to create a prototype of a game of this caliber (compared to, let’s say, Splendor with much less components). When making a prototype for a game of this type, is it more in the 10$-15$ range, or much higher such as the 30$-40$? Simply curious for future personal prototype creations. Jonathan: Because of the miniatures, each prototype of Scythe cost about $300 to make. Without the miniatures, probably closer to $40. Thanks for the information, Jamey. If you only had a prototype that was functional, but not production quality in terms of appearance, do you think it is worth it to send to reviewers? The other option I was considering was to ask for a feature and agree to send a final product after the Kickstarter campaign, but I was thinking this might have a lower success rate. Thoughts? Oliver: Thanks for your question. I try to send out prototypes that look as much as possible like the final version. Bloggers are going to want to present it visually to their audience, so form is going to supersede function in their audience’s eyes even if they focus on function. Perhaps your manufacturer could send you some pre-production samples, or you could find someone on Etsy to make a few functional and beautiful prototypes for you? That’s a good point about it being represented visually. I will explore a few different avenues to try get something that is more pleasing to the eye! After I get the prototypes sent out, do you have any insights into what you can offer to other bloggers after that? Thanks! Obviously you are in a better position to create these higher quality prototypes now, but I’m curious as to what your prototypes were like for Viticulture. Did you still willingly put money down for higher quality or was it all as barebones as could be for you? I’m asking because I’m taking my design to the playtest area at UKGE next month and I’m thinking hard about the balance between cost and quality for my first public showing. Steve: My prototypes for Viticulture were VERY rough. They were all handmade, aside from the board, which I printed on foamcore at a local printer/copier. Overall, they were very bare-bones. If you’re just playtesting the game at UKGE (opposed to showing off a nearly complete version), it’s totally fine for it to look like a prototype. In fact, if there’s too much polish to it, people will often end up commenting on the components and art as if they’re final instead of the mechanisms. The one thing I recommend focusing on is the user experience as it relates to graphic design. That’s important no matter what stage of playtesting you’re in. I’ll keep that in mind, thanks Jamey.